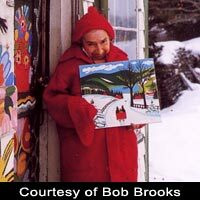 Maud Lewis was born in Yarmouth County and endured many hardships in her early life. As a teenager, she started to experience deformities on her face and hands as a result of a childhood disease. In 1938, at the age of 34, she married Everett Lewis and together they lived in the small 12.5' x 13.5' one room house with a sleeping loft and without the comfort of electricity or plumbing for over 30 years. Her art began with Christmas cards. Her colorful cards, and later paintings, depicted nostalgic scenes of rural life in Nova Scotia. Her paintings were always happy and bright. Maud loved to paint birds, butterflies, flowers, sleigh rides, and teams of oxen with eye lashes. Her artistic expression went beyond the art board. She decorated every available surface of their home with her cheery art. Word of her art and the brightly decorated home beside the road got around in 1965 with the release of a film documentary and a national magazine feature on Maud. White House Secretary under U.S. President Richard Nixon and Nova Scotia Premier Robert Stanfield were among those who contacted her to purchase one of her paintings for $5. To Nixon's White House secretary who wrote her on official White House Seal stationery to order a painting Maud wrote back, "You have to send the money first." Photograph by Bob Brooks, from the book "Maud's Country Landscapes that inspired the art of Maud Lewis" Lance Woolaver, from Nimbus Publishing Ltd.